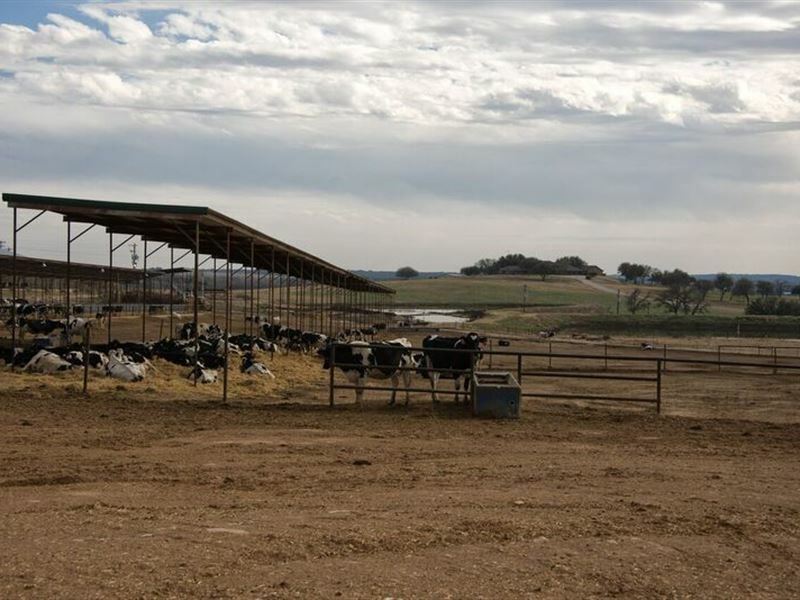 With a location just off the Hwy 377/67 Bypass around Dublin, TX this dairy farm offers great access to major highways such as Hwy 281 and Hwy 377 allowing for easy access Fort Worth, Dallas, Abilene, Midland, Austin or San Antonio. This dairy is an investment property that is leased to a large corporation with 7 years remaining on the lease. The dairy is meticulously maintained and operated. The facility is currently permitted for 7700 total dairy cattle of which 200 are milking head and has a pending permit change that could increase the milking head to 3000. Double-27 Parallel milking parlor with office, equipment room, and milk storage room with attached covered holding pen. Single 12 special needs milking parlor, with one attached 155 head freestall barn,one freestanding 40 head freestall barn, one 824 head freestall barn, one 820 head freestanding barn and one 420 head freestall barn, one 77 head maternity-hospital, one 250 head covered feed land, one 695 cow and 140 heifer covered feeding lane, four shade structures, one maternity barn, one shop building, one commodity barn, one hay barn, additional sheds and support buildings, truck scales (2017), and scale house, one main brick veneer dwelling (approx. 8030Sf under roof, 5 bedrooms, 3.5 baths) with a detached pool house, in-ground pool, three employee dwellings. The site improvements include 8 center pivot irrigation systems, one emergency power plant, buried water lines, buried irrigation lines, septic systems, pipe and cable fencing, livestock fencing, roads, settling basins and four retention control structures (lagoons), nine commercial water wells, domestic water wells, underground irrigation and water lines. The freestall barns, covered feed lanes and open feed lanes contain about 6,784 linear feet of feed lanes. In 2015 approximately was spent to repair and replace many of the structures and roofs as a result of storm damage. The 1073.356 total acres consist of improved and native pastures. The topography is rolling and scenic and there are areas of heavy woods offering good wildlife habitat. The primary soils are sandy loam, clay loams, and complex of clay and sandy loams. The main native grasses are big and little bluestem, switchgrass, indiangrass, Texas wintergrass and Virginia wildrye. Small grain, corn and grain sorghum are the main crops. Native trees are mainly Oak, Pecan and Elm. Erath County is a beautiful and productive Texas county located in central Texas, rich in diversity and includes the communities of Stephenville, Dublin, Three Way, Morgan Mill, Bluff Dale, Lingleville, Huckabay, Selden, Alexander, Duffau, and Clairette. Estimated Population 2010 - 36,184 The county seat is Stephenville and the home of Tarleton State University. Stephenville is the 1 highest milk producing county in Texas giving it the title "Dairy Capital of Texas". A complete and detailed package on this offering will be furnished with a client registration and confidentiality agreement. Please contact the listing broker for more information. Shown by appointment only. This is a leased property and no trespassing is allowed. All showings must be scheduled and all parties must sign in with office personnel.